It's shaped like an igloo, but wickiups aren't made of snow and ice, there made of arched wooden poles and some sort of roofing material, such as grass, brush, reeds, or cloth—basically, whatever is around the area. 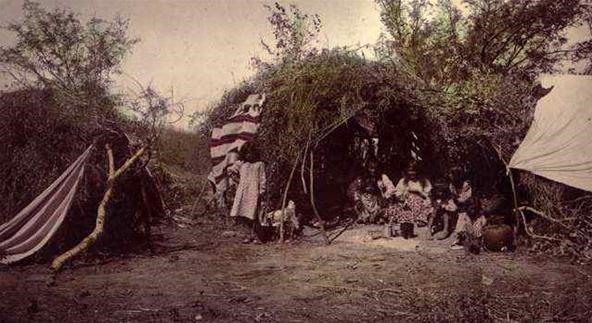 Wickiups (or wikiups) are used to denote the kind of makeshift dwelling Native Americans would use the American Southwest and West, and is more of a generic term used by non-Native Americans for any type of temporary, seasonal domed structure built by American Indians. In the American Northeast, they're more commonly referred to as wigwams (which are actually more permanent structures) by Native Americans and non-Native Americans alike. 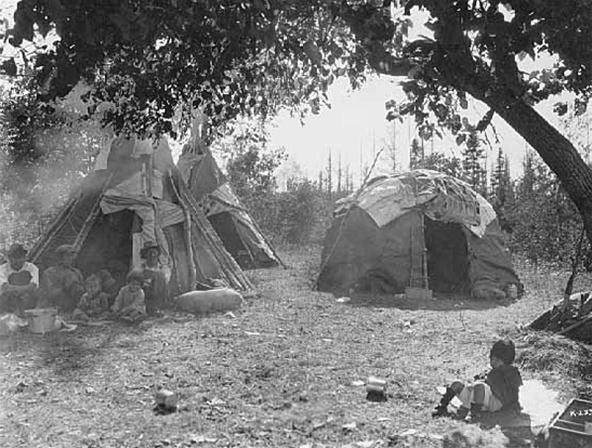 Ojibwe wigwam (right) with Dakota-style tipis (left). 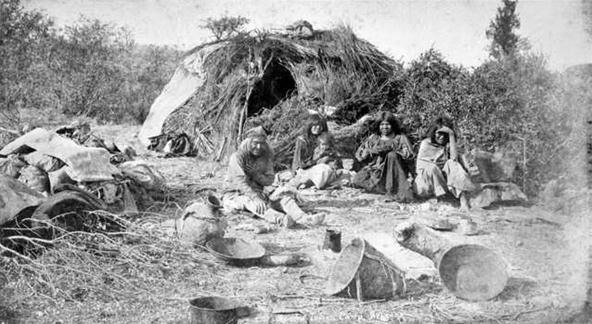 A wickiup from around 1885. I'm loving these bingos.. simply for vocabulary. hoping they'll come in handy for crosswords someday. Quite possibly. Some of the more unusual ones might not ever pop up in a crossword puzzle, but WICKIUP could definitely make an appearance, I would think.